anatomy of :: i woke up like this. 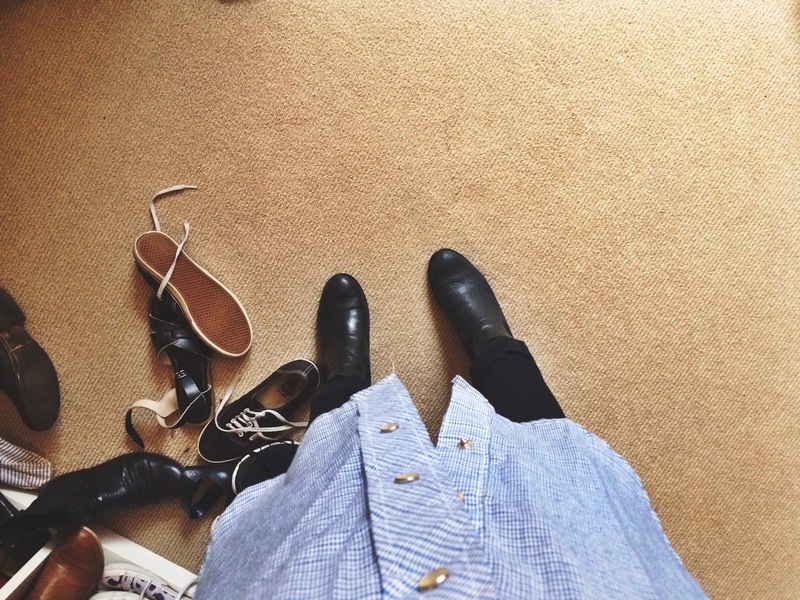 This is how I use my weekends and holidays – outfit experimentation. Time to test the waters with new combos, new pieces, go crazy, because if you can’t wear it now, then when can you? Today was my accidentally-on-purpose foray into the “I woke up like this” / pyjama look that has been infiltrating the world over the last few years, thanks in part to Alexander Wang and his genius brain. And it took me until now – mostly because I’ve never been a real pyjama wearer anyway, I prefer the baggy old tshirt and trackies for my casual slumber. Then my sister decided to toss out this vintage button up, then I took the liberty of taking it, turning the trash into treasure. And today it was clear to me that this old man’s shirt could in fact be pyjamas. It even has snap fasteners, so case in point – I’m reliving my baby days in snap-shut jumpsuits, the glory period. Comfort is bliss, walking around like you don’t care is a treasure. Next level outfit = going the whole shebang and finding some matching pants. But let’s just take it one ugg-booted step at time. Previous Post photoshoot :: the young ones. Next Post inspiration wall :: apr. Comfy chic weekend casual looks are the best! Wish we could wear them every day. Check out our blog for business casual / weekend casual fashion inspiration for both men and women — we give tips on your workday and free time wardrobe! We’d love for you to check us out and share your thoughts with us.